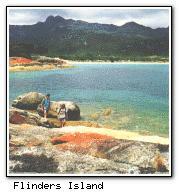 Flinders Island is located off the north-east tip of Tasmania in the Furneaux Group of islands. It is the largest of the Bass Strait Islands. Whitemark is the major town, with other smaller communities including Lady Barron and Emita. There are great fishing and diving areas on the island. In fact, fishing is one of the main economic activities, along with grazing and tourism. Scuba diving will take you close to some of the old shipwrecks which dot the area. Mt. Strzelecki (in background of picture), named after the Polish explorer, is a challenge for rock climbers. The mountain, which rises to 760m (2280 ft), lies in the Strzelecki National Park, to the south of Whitemark. Emita, to the north-west of the island, is the location of the Wybalenna Historic Site (below). In the 1830's, as the population of Tasmanian Aboriginals dwindled, many were re-settled at Wybalenna in an attempt to consolidate the tribes and save the race from extinction. Wybalenna fell into disrepair, but was renovated by the National Trust in the 1970's. The site is significant to Aboriginal peoples. Also at Emita is a museum, marking not only the Aboriginal presence but exhibiting relics from Bass Strait shipwrecks. Lady Barron, on the southeast corner of Flinders Island, overlooks Cape Barren Island, to the south of Flinders. It is home to the protected Cape Barren goose. Flinders Island Topaz can be found around the coast of the island. A semi-precious stone, this is also known as "Killiecrankie diamonds". The Furneaux Group of islands was discovered by Captain Tobias Furneaux. Furneaux was the commander of one of Captain Cook's supporting ships, but became dissociated from the rest of the fleet due to a storm in 1773, resulting in the islands' discovery. Flinders Island is named after navigator Matthew Flinders. Flinders Island is accessible by air from either Launceston or the Melbourne area. It has twelve 3½-star (RACT rated) accommodation facilities, mainly taking the form of holiday units.